Before becoming a Kenan Fellow, I knew very little about the Hyster-Yale Group. I had driven past the facility on numerous occasions but I didn’t know what the plant was for. After spending three weeks this summer at the facility in Greenville, I now know so much about the company, and know just about what every employee at the plant does and why his or her role is so crucial to the manufacturing process. Prior to my internship, I had never been inside a manufacturing plant. My most interesting day was on the plant floor with the operations manager. I attended a meeting with the supervisor from each value stream, and loved seeing the data charts about their particular section. This company is super data driven so I found that very relatable to what I teach. I spent the remainder of the day seeing different parts of the plant and shadowing people from supervisors to assemblers. I was truly fascinated by the whole operation. Throughout my internship, I was constantly thinking about my students. I teach in an area where most of the students come from low socioeconomic households so most of them hardly ever get the chance to travel outside of the county. I was not aware of how many jobs there are available within a manufacturing plant regardless of education or experience. I’m excited to have conversations with my students about the many different career options that are available to them. I also cannot wait to show them how much the math they learn in seventh grade applies to real-world jobs. I am most excited to apply what I’ve learned to my classroom. I am in the process of creating an entire unit plan with lessons to be taught at various times throughout the school year. By doing this I’m hoping my students will constantly be able to make connections from math to future careers. I plan on focusing on proportional relationships, inequalities, unit rate, scale drawings, and angles. Throughout each lesson, I plan to incorporate experiences from my internship. Overall, I had a wonderful learning experience at Hyster-Yale and am so thankful for the relationships that I’ve built and cannot wait to take my students on a field trip to the plant. 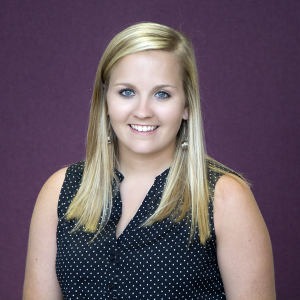 Samantha Haislip, a 2016-17 Kenan Fellow, teaches math at Greene County Middle School in Snow Hill. She is part of the Biogen Foundation Teacher Leader Cluster in Greene County sponsored by the Biogen Foundation and Greene County Schools.